We are all looking forward keenly to the visit of the Trinidad football team next month—The first real international football visit the island has had practically in its history. I see however a suggestion being put forward with which I by no means agree, that is that Hadden now playing for the Kingston Club, should be "lent" to Trinidad during their visit here. This would I am convinced, be a thoroughly unpopular and unsatisfactory move with the football public here. It is true Hadden was formerly in Trinidad (though he is not a Trinidadian)—he did not, as far as I know, ever play for the Trinidad team—but he is now resident in Jamaica and working here, he is playing for the Kingston Club and has played for the Jamaica XI itself on every occasion it has taken the field this season. He is recognized as the best civilian back in the island now, and his clean and sportsmanlike play have rendered him immensely popular with the public. To loan this player, the best defender we have, to the opposing side would be a fatal mistake; and would be moreover unfair to both sides. 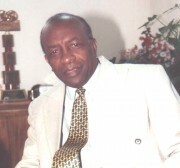 Hadden would possess a knowledge of the Jamaica attack which would give Trinidad a considerable and unfair advantage—and moreover it would be placing Hadden himself in a very insidious position; for, if playing for Trinidad, he could not help having a lot of sympathy for the Jamaican side for which he has been playing this season. The reason given for this very dangerous move is that it would save the expenses of one Trinidad man—well, Trinidad are, I understand, bringing 15 men anyhow, surely that is enough to carry through the tour—and if it isn't let them bring another man, let us do anything rather than pass over to Trinidad the best defender we have in an international contest that is going to be as keen as this one. The football public won't like it! and neither will Hadden!